L'Aventure is a popular perfume by Al Haramain for men. The release year is unknown. The scent is citrusy-fresh. It is still in production. Nasty "bath cleaner note", almost unbearable in the beginning, but then improves a bit, but still annoys me after several hours. Bref-Klon, yes, but otherwise I see few parallels. Who or what is Creed? When you hear the name Creed and especially Creed Aventus, the whole perfume world is in ecstasy. But as soon as we look at the prices, we realize 300 euros for a fragrance? There must be comparable, cheaper ones !!!! I personally have two in my collection that bear resemblance to the infamous.... Creed Aventus have. Once Amarf Club de nuit and the above Al Haramain L`Aventure. I really have to say who loves the fragrance DNA, Creed Aventus and who can't get along without it, buy Al Haramain L`Aventure. The fragrance is currently on offer and is also available with polo. (Notino online shop). I don't think you have to say a lot of words about the scent DNA. Three keywords ANANAS, FRESH, LEICHT HOLZIG. Also LONG CONTINUES up to approx. 5 hours. Conclusion : Do not hesitate long, buy the fragrance, I personally think you do nothing wrong with the fragrance (just by price-performance ratio) and you can still enjoy a beautiful polo. Yeah, yeah... I know... I've been an abentus lover since the moment I left perfumery four years ago. Therefore I have some twin fragrances to test them and to have something cheaper for after the sport. To my sensation: The fruity one is held behind a curtain by the smoky/woody one. Which personally pleases me in the cold month. For the spring, the summer and the evening restaurant visits I use the original. Conclusion: The fragrance DNA is well hit - a little smoky - but good and not cheap. Received the L'Adventure last week through Fragrancenet.com, and made my SOTD as of 12/10/18, so far I have this L'Adventure, CDNIM atm as similar to the Aventus DNA. CDNIM is more smokier in your face, L'Adventure is more fruitier not as sharp as CDNIM. But I prefer the L'Adventure scent opening than CDNIM. So much Aventus clones lost count lol. Sooner or later I might end up purchasing Aventus down the road. L'Adventure take on the King Aventus is similar to opening and the dry down to my nose. But my nose prefer L'Adventure over CDNIM. My name is Bond, Aventus Bond; and you are? My name is Le Chiffre but my friends call me L'Aventure! Aventus Bond: So you are the one they call a copy of me? L'Aventure: I am much more than a copy. I am fruitier, younger than you and less demanding to possess. Aventus Bond: Do you think a cheap copy will be able to destroy my noble achievements? L'Aventure: You are only a relic of a long forgotten phenomenon. Your time is up because I'm meant for everyone and they won't know the difference. Aventus Bond: The difference? You'll live in my shadow forever and never be more than that. I am the completion of a masterpiece, one you may only experience through the grace of the sun. L'Aventure: Aventus Bond is dead, long live L'Aventure! I just ordered it back. Because I think he's almost perfect. But let's start all over again. I came across the scent because I wanted a cheaper alternative to Aventus. So, quasi for everyday life, sports and work. The expensive Creed is a pity for me. Now I've come across this cheap Dupe. Hmmm for the price I didn't think long and ordered directly. And I was curious. I was a bit sceptical, but the comments were almost all positive. Let's start with the packaging. Very nice box to open. Reminds you of a watch box. The bottle is square and looks elegant. But after some time, the silver starts to flake off. It's also unwieldy and I don't think it's beautiful. Now the scent itself. First sprayer... I immediately met a power cloud of citrus. Ui violent... no pineapple just pure bergamot. I'm afraid I find far too much. A little pineapple would be great. Hmm, that's supposed to be an Aventus clone, I figured. What's wrong here? After 20 minutes then perfect. Yeah, that's mega, let him smell that. The smoky one comes through. You feel comfortable and masculine. The smell of citrus is getting less and less and the base and heart notes are getting more and more. Beautiful birch(tar) and woody smell. I think it's a super clone of Aventus. But the biggest WoW effect didn't come until the next day. The shirt where I sprayed it on, I opened in the office. When I was back in the room the next day a cloud came towards me which I love about this scent. As much as I'm addicted to this scent. Compared to the original Aventus I find it even better in the base and heart notes. The top note, however, is terrible. I can see over there. Maybe I'll get a pineapple scent and spray it on at the same time as the scent. Think then he gets close to perfect. I think price-performance is good. Durability and Sillage Top. Immediately after spraying, citric notes dominate, especially the bergamot stands out. Unfortunately, it is a sweet-synthetic bergamot that reminds me more of effervescent powder than of the real fruit. In short: the first 10-15 minutes are the biggest weakness of this perfume, then it gets much better fast. As soon as the woody notes and the musk from the heart and base join in, L'Aventure clearly goes in the direction of the great model Aventus. Even if the note pyramid does not contain a birch, there is a smoky note in the background, typical of Aventus; it remains unclear to me where it comes from. Another note typical for Aventus, the pineapple, is missing (strangely enough) as well. The combination of citric notes and elemi resin comes close to a pineapple note, but the famous fruity-true Aventus pineapple is never reached. The performance of L'Aventure is good to very good, but not any more. The direct competitor CDNIM is clearly in the lead, but due to the extreme smokiness it may also be more suitable for other occasions. L'Aventure can easily be worn as an everyday working fragrance, with CDNIM I think you should be more careful. The bottle looks very chic, but looks cheap when touched and lies badly in the hand. Conclusion: Opening terrible, then a super everyday fragrance with solid performance. There is a similarity to Aventus, but the (real) pineapple note is missing. Price/performance is top. Aventus - a modern phenomenon. In recent years, no fragrance has polarised as much as the aforementioned Creed silver disc. First of all, I have possessed Aventus (even if only as a bottling) and can still remember exactly the first encounter...no scent has ever knocked me so out of my socks, trusted me, and yet strange, full of nostalgia and somehow, in a strange way perfect. Less perfect, of course, was the price, even the small 2.5 ml bottle, which had disintegrated into thin air after a few uses, cost me at that time almost 20 euros. And somewhere, rightly so. An expensive, entertaining pleasure, but a wonderful one. The wave of imitators up to bold, even confessing copies (isn't it, my dear Armaf?) caused by the hype around Aventus didn't slosh past me without a trace. The "King of Fragrances" at a ridiculous price? Could it be? DARF that ever be? This must be reconciled by everyone himself with his moral demands; in the end, withdrawal prevailed for me. I just needed it, the mentioned bottle, which so quickly opened up into Nirvana, was painfully missed by me. Nundenn, long speech, short sense: After research 3 candidates crystallized on the list of test candidates; one of them was Al Haramain's "L'Aventure". That this should be a direct Aventus clone and wants, outwardly first only the name screams. However, the bottle itself is a different number. In short, terrible. Some may like it, but this completely mirrored and cheaply chrome-plated container, with a cap in rubber door stopper optics and loveless writing has the charm of a reciprocating piston on me. Maybe something for car lovers. But now for the important part, does he smell like the king, our little silver Arab? After the fragrance (which is extremely oily on the skin, by the way, I had never had it before) was dried, the whole thing turned a bit. The Patchouli from the base comes here strongly to the wear, actually a little too strong as I find. Aventus doesn't have that either, and that slightly pushes the fragrance in an oriental direction. In general, if you look at the fragrance pyramid, you can hardly see any agreement with the Creed. How's he supposed to smell like that? Can he do that at all? He can. You just have to give it some time until the synthetic sweet top note and the flowery-powdery one have evaporated. What remains is actually a fragrance that reminds us of Aventus. Especially in the Sillage. If you hold your nose directly to your wrist, you can smell the difference, and clearly so. I don't know what some YouTuber have in their nose that says 98% match. L'Aventure is less mature, less harmonious and generally much sweeter, flowerier, and shallower than Aventus. It's this soapy-powdery, which just doesn't fit with the rest of the fragrance. But the scent you leave behind actually smells deceptively similar. 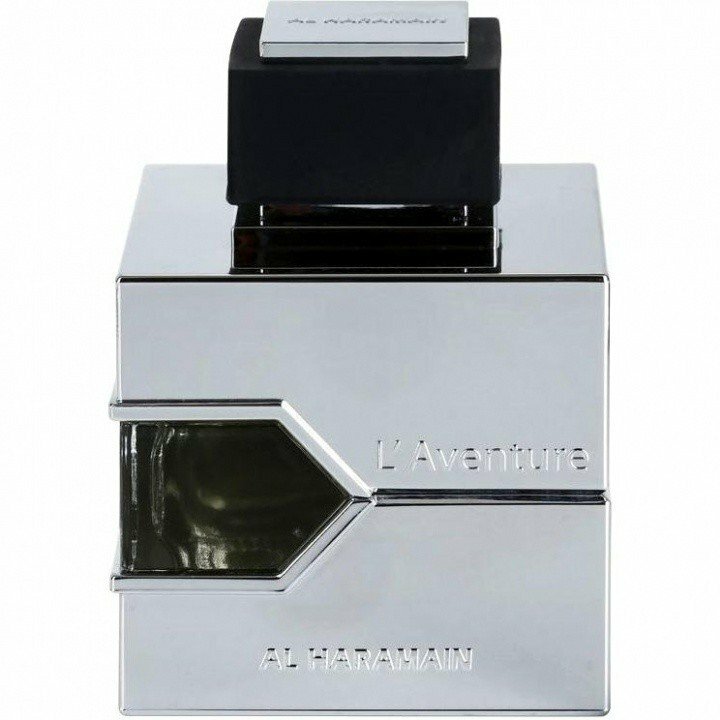 Conclusion: Al Haramains "L'Aventure" cannot replace the king of fragrances. He is too incongruous, too sweet and there is a general lack of head and heart notes. What he does very well, however, is the base note. This one seems to copy the Creed DNA surprisingly well and he clearly sprays the Aventus Vibe in the Sillage. For the small money (the 30ml bottle cost me as much as the 2.5ml sample) you can't really complain. Still, too bad somehow... well, it would have been too nice. I think I'll start scratching up the coins in my wallet later on. To get the pineapple, I ordered a natural pineapple aroma from Dragonspice, and I have to say, the scent in the mix now smells much rounder, more harmonious and more like Aventus. The right ratio is important here, as the fragrance oil is very concentrated, so it is better to test it drop by drop. The natural sweetness and slight astringency of the pineapple seems to dampen the somewhat aggressive-synthetic top note and take away its strength. Instead, a warm pineapple aroma now comes to the fore in the top note, which significantly improves the fragrance experience from the first hour and makes it definitely wearable as a "casual" version of the luxury fragrance. Now only the smoke is missing...but for that there is the Armaf! Its a great Creed Aventus Clone. if you find a better deal then Clud De Nuit intense men buy it.. you will not regret it. Opening is Not smooth as Creed Aventus but its better then CDNIM. get it if you want cheap alternative of creed aventus. Good representation. good bottle design although cheap material. last 8-9 hours on skin. get compliments. overall all great value for money.